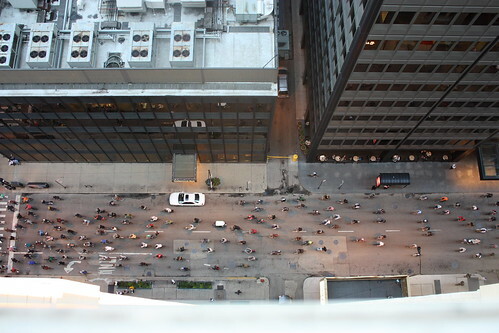 When you live in the heart of a big city, there is often a lot of street noise. My friend Ben hates it but I think it makes life pretty exciting. Usually its just a lot of car noises or sirens zooming down the street but occasionally you’ll hear something really extravagant that requires a glance out the window. Back in the fall, I was reading a book when I heard a ton of hooting and hollering coming from the street. At first I wrote it off but it kept going for a while so I decided to investigate. 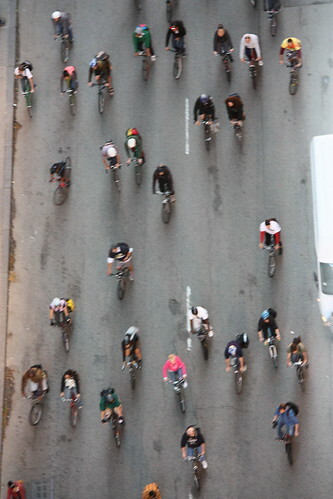 When I looked down into the street, I saw this hoard of bikers zooming down the road. At first I thought it was a race but then I realized it was like 5 in the evening. So I guess I really don’t know what these bikers were up to but it was fun none-the-less. The pictures were taken with me dangling half my body out the window of my 17th floor apartment so excuse the quality haha. Miss. Courtney cleared up my mystery bike ride! 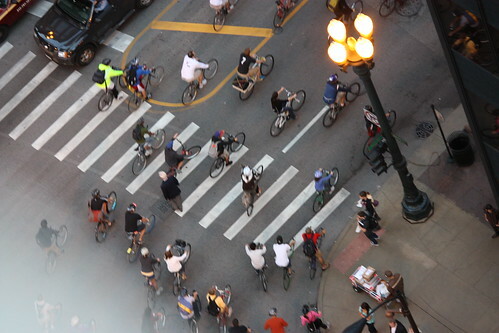 It was a critical mass.